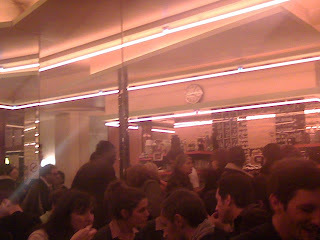 Paris Restaurants and Beyond: Aux Deux Amis - Is That a Herring On the Floor or Are You Just Happy to See Me? 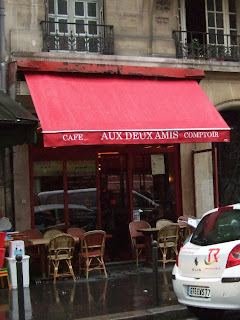 Aux Deux Amis - Is That a Herring On the Floor or Are You Just Happy to See Me? Well, as it turns out, I obviously wasn't the only one for whom that assessment struck a resounding chord. By the time the Moose and I arrived at an early 7:30 p.m. on a Wednesday evening, the place was packed with young and up Parisians, some sitting, some standing, but about as jam-packed as a small storefront bistrot can be. The entire interior seemed to be wallpapered in mirrors, bathed in yellow flourescence. 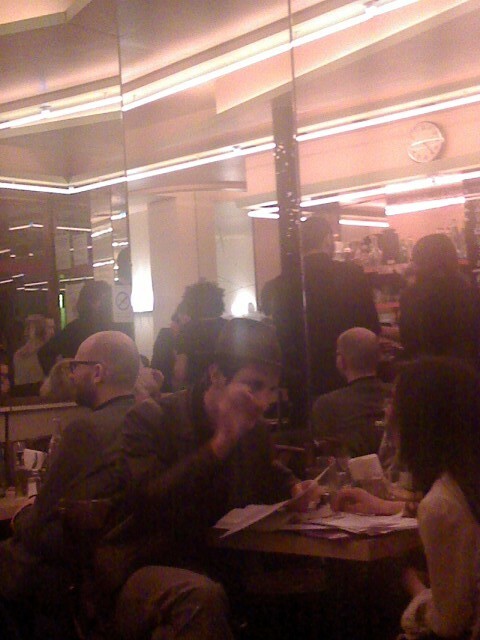 It took about 15 minutes for us to be guided to the back - and when I say guided, I mean, a narrow path was cleared so that we could traverse the room - no, it's not there - back to the front, yep, there it is, your reserved table, between the window and the long marble bar. I should add, 'table' is probably an exaggeration - the little round cafe table was more of a nightstand, but neither Moose nor I was phased to the least, having imbibed a few whiskeys at that little Rhum Marin bar on rue St. Maur between ave. Republique and Oberkampf, where, you won't believe this, the laid-back owner plays some decent jazz compilations. It didn't take long to be served at ADA, even given the tumultuous atmosphere. We started with three tapas dishes picked randomly after the waiter read the list of about 12 possibilities from his little scratchpad: piquillos, moules, and St. Jack panais. A pot of vin rouge (19€) arrived when the bartender stretched out to reach our table--as it turned out, our food arrived in similar fashion--which was a lot more sensible than asking our waiter to make any more trips to our table than one could humanly navigate through the crowd. (It was only later that I noticed that the 'carte' was scrawled on one of the mirrors next to the bar, but have a look at the adjoining photo and tell me if you could have ordered from that.) The wine and three tapas plates and bread challenged the miniscule table more than one should have asked, but we managed a fine balancing act and thoroughly enjoyed round one. Simple dishes, but fine quality, with a little bit of panache thrown in by whoever prepared the dishes. About midway through the food and wine, Moose sat back contentedly and, taking in the room, just cooed, 'This is why I love this city.' I know what he meant. By the time I circumnavigated my way back from the 'rooms', I was happy to see that Moose had taken the initiative to order round two, which again consisted of three choices: Hareng pomme a l'huile, bourrata tapas (a very tasty and fresh Italian cheese, made from mozzarella and cream), and a salade de choux. I should explain, Moose and I were going moitie-moitie on each of these dishes, so when it was my turn to have a go at the herring, I looked at the plate and immediately wondered where my half of the herring was. When Moose explained that it was actually lying on the floor under the table, it was at that point that I realized that our functionally-challenged table had met its match. Nonetheless, the remaining garnishes were very tasty, and another day, I am sure, I will be able to taste the accompanying herring. 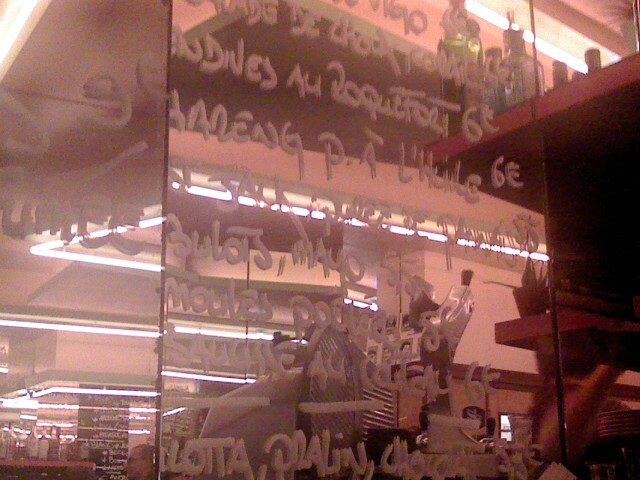 The tally for two pitchers of wine and six tapas selections came to a reasonable 70.50€. An inexpensive prix-fix lunch gives way to a tapas-style dinners, so if you're looking for more of a sit-down full-course meal, lunch is your better bet. Still, if you want a truly Parisian experience, go for the evening's tapas. It's not haute cuisine, but I don't think you'll regret it. And go when it's packed and jammed, because, well, it's just more fun that way. Hi there - I'm glad you like Aux Deux Amis; it's one of my favorites. However, while I appreciate that you at least attempt to attribute the photos to their sources, it's always best to ask permission before using anyone's images, not just to be polite, but to avoid copyright infringement. Also? 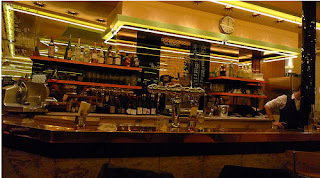 The wide angle photo of the bar was not taken by me, but by Meg Zimbeck, whom you do not credit. And my photo, of the charcuterie plate, was not even taken at Aux Deux Amis. Oops. We recently reviewed this place and have only one regret: not living next door so it could be our local!